Words play a magical role in bloggers' lives. 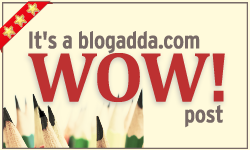 The bloggers at BlogAdda understand this better than anyone else. So last week, we thought of using words to get creative with a story. Our prompt for last weekend was 'Waitress, Wood And Watch'. These unrelated words were to be used in the best possible way and bring them alive with a real life essence to it. Here is how the bloggers worked their best. Check out the entries. Congratulations to all the bloggers!